The Center for Career Education (CCE) is available to students from their ﬁrst day of classes at Columbia. We encourage students to connect with CCE in their ﬁrst year to learn about our services and programs and to develop personalized career plans. LionSHARE - CCE’s database of part-time, full-time, and internship positions. Annually over 20,000 positions are posted in LionSHARE. CCE-run internship programs. Check out student experiences in CCE-run programs. Learn more about the advice we share with students on finding internships on this video. 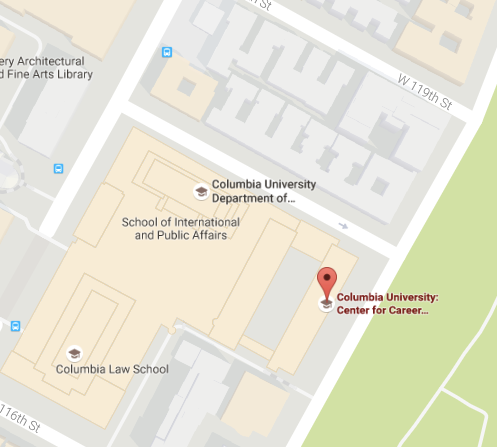 CCE encourages you to consider hiring Columbia students and alumni for your organization. Reach out directly to us or connect us with the Human Resources team at your organization. The Employer and Alumni Relations team at CCE will help you advertise your positions and recruit the best Columbia candidates for your company. Learn more about how CCE works with students below! For more information about programming for CC and SEAS parents, see Family Engagement.